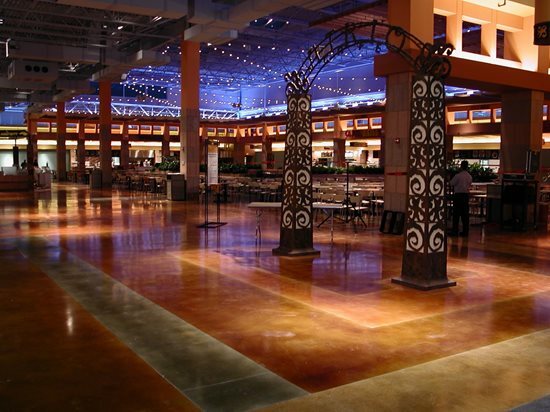 Shopping mall floor in Orlando, Fla., was resurfaced with Pentimento (gray) and treated with different concentrations of PatinaEtch acid stain (amber). Great art doesn't just hang on walls or sit atop pedestals. You may also find it underfoot, in the form of a beautifully crafted and detailed concrete topping meant to be walked on as well as admired.Such toppings, and the techniques and coloring processes that transform them into dazzling works of art, are the specialty of Colormaker Floors Ltd. of Burnaby, British Columbia an artistic operation that uses concrete as a medium vs. a concrete company with artistic aspirations. Colormaker President Gary Jones began his venture in artistic flooring by installing decorative slate in his homeland of Australia. He moved to Canada in 1989when the decorative flooring industry in North America was still in its infancy to start anew. He began experimenting with the use of concrete and various stains to replicate the look of stone and soon realized that concrete was much more versatile than slate. 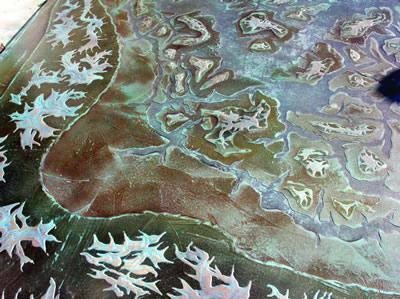 This led to the development of innovative cementitious toppings and coloring processes that allowed him to unleash his creativity with decorative flooring. With the launch of Colormaker, Jones began sharing these products and techniques with other artisans. In addition to providing topping products, Colormaker also acts as a design consultant and trains and works with installers. Were a little different from most companies that just manufacture topping materials, says Jones. We have a network of artisans that were associated with. In many cases, when we send products to a project, we will also send somebody with experience using the products. We have these artists at our disposal on any project, so when we get a call or inquiry we can redirect the customer to the right person within our network. This network extends throughout North America and is branching out into other parts of the world as well, including Japan and Australia. Installers have traveled across Canada and the U.S. to work on large commercial projects for such companies as Whole Foods, Sur La Tab, Starbucks, Bootleggers, Rainforest Cafe, and numerous shopping malls. Although most of Colormakers business is commercial, the company also caters to the decorative concrete needs of homeowners, museums, office facilities, and even wineries. These decorative techniques can be used not only to beautify floors, but also walls, countertops, patios, walkways, hallways, stairs, and more. The applications are virtually unlimited. Colormakers proprietary toppings are based on age-old Italian plastering materials and methods, with workability and performance enhanced by modern chemical technology. The product names Pentimento, Sgraffino, and Rotofinoreflect their Italian heritage. I love Italian artwork, says Jones. I felt those names, which are derived from traditional Italian plastering techniques, were more indicative of what were doing. Repeated trowelings of a Pentimento surface achieves a high polish. Pentimento is Colormakers flagship product. It produces a highly polished, marbleized surface with a tactile sensation one customer has described as walking on velvet. A base layer is placed with a gauge roller that puts down just the right thickness of material (approximately 1/8 inch). Thats immediately followed by a texture roller that flattens the topping and brings some moisture to the surface. After a waiting period of about 20 minutes, installers finish the topping with a hand trowel, working on spiked kneeboards so they don't mar the surface. Once installed, the base can be re-troweled numerous times to achieve the desired degree of polish. A finish layer can also be applied to enhance depth and color. Sgraffino provides a grainier, more textured surface than Pentimento and is suitable for both interior and exterior flatwork applications as well as vertical surfaces. Often the material is applied in numerous coats at a paper-thin thickness, with different hues used for each. The coat underneath shows through to the next coat to create layers of color. Different troweling techniques can also be used for each coat. Sgraffino goes on very fast, since you're only scratching the surface with a little bit of material. As you build layers, each layer can get finer and finer, says Jones, adding that a 40-pound bag of material covers 400 to 500 square feet. Rotofino, Colormakers newest topping product, is rolled out very fine with a flat pipe roller and then rolled again with a texture roller. It acts almost as a self-leveling material because it requires no finish troweling after texture rolling. It ends up as a smooth, polished concrete surface but without the swirls you would get from troweling, as with the Pentimento finish, says Jones. He explains that its a good product for use in restricted areas, such as hallways, because rolling is easier than using trowels in tight spots. Prior to application, the toppings are mixed onsite with a liquid acrylic polymer, which improves topping adhesion, increases tensile and flexural strength, improves abrasion and freeze-thaw resistance, and increases surface density. The concrete surface is also primed before topping application to ensure good bonding and long-term performance. We are very adamant about priming the surface first, says Jones. 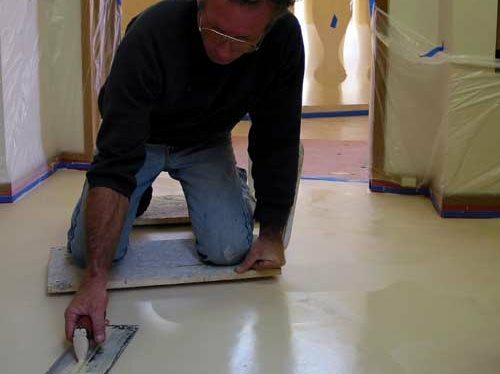 The floor is always prepped and primed the day prior to topping installation, and then we re-prime the next day before we start. A natural rock fissure in the California desert was the inspiration for this floor in Whole Foods, San Mateo, Calif. The concrete was resurfaced with Pentimento (gray), and the fissure was created using Sgraffino (gray) integrally mixed with different Colorfast colors and water-based Someru dyes. Colormakers toppings come in two standard colors: concrete gray or white. Each provides a neutral canvas that allows artisans to experiment with various coloring techniques. Often several coloring methods are combined, or layered, to produce unique effects. The new topping surface can be integrally colored during installation as well as after initial curing. For integral coloring of the Pentimento and Rotofino toppings, theres Color - fast a ready-to-use finely ground blend of natural and synthetic iron-oxide pigments and dispersing additives. Developed by Colormaker, the product can be mixed into the topping before its applied or cast onto the surface as the topping is rolled. The colors are lighter and more pastel in tone when used with the white base and richer in hue with the gray base. Colorfast is designed to disperse instantly, and various colors can easily be intermixed to create a new range of shades. Jones says that installers will often mix a small amount of Colorfast into the topping before its applied to produce a subtle base color. Then they will sprinkle additional Colorfast on the topping during roller application to produce interesting highs and lows of color intensity. After the toppings have cured, they can be further enhanced by acid stains and dyes. 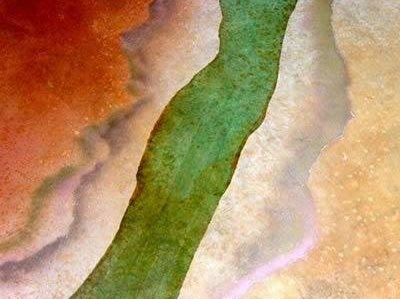 Colormaker offers a proprietary line of acid stains and water- and solvent-based dyes in a vast array of colors, including subtle earth tones, vibrant hues, and pastels. We use a lot of dyes, which for us go hand in hand with the patina stains, says Jones. The dyes back up the stain and give you a wider range and vibrancy of color. They also allow you to do more layering of color. An existing concrete surface is transformed with Rotofino (white) and a combination of PatinaEtch stain (aged buff) and Someru dyes. The final step in the process is to protect the floor with several coats of sealer and an acrylic floor finish. This helps to preserve the color, improve resistance to foot traffic, and minimize maintenance. Floor owners simply need to vacuum or sweep the floor occasionally or wash it with a mild detergent. Because the creative possibilities with Colormaker products are virtually limitless, Jones focuses much of his attention on training installers and providing onsite consulting. Other artists in Colormakers network participate in these training sessions. We show them how to push the envelope with color, through layering and other processes, says Jones. Initially, Jones teamed up with fellow artisan Mike Miller of The Concretist to train installers on actual projects, so they could participate in the entire experience. While Jones still offers these onsite training experiences on occasion, he now also conducts monthly workshops at various locations. These Wild Workshops cover the steps in topping placement and explore a broad range of coloring and texturing techniques. This floor art was created at World of Concrete 2003 by Kelley Burnham, an artist who works with Mike Miller of The Concretist. Kelley used Sgraffino (gray) and Deco Graphic solvent-based dyes, enhanced by various stenciling and layering techniques. Once installers are introduced to these methods, Jones or one of the other artists in the network will provide additional support as the installer embarks on his first Colormaker project. Thats a major benefit of anyone using our products we provide that onsite consulting rather than leaving them to look after themselves, says Jones.